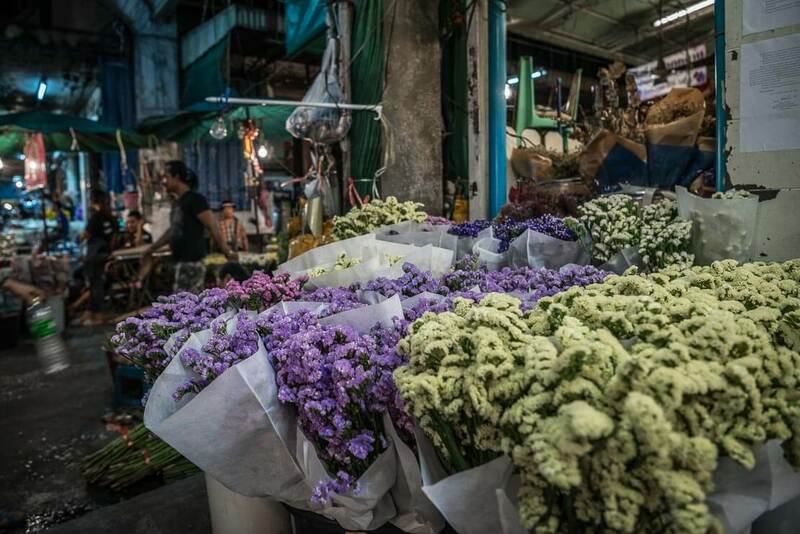 Pak Khlong Talat is the biggest flower market in Bangkok. 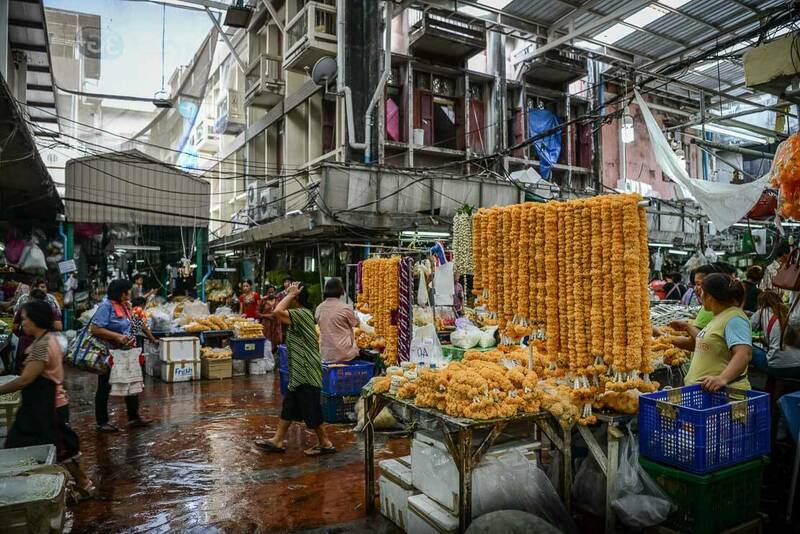 This bustling and authentic market is a fascinating place to visit, especially for those, who are looking for lesser known and off the usual tourist trail places in Bangkok. 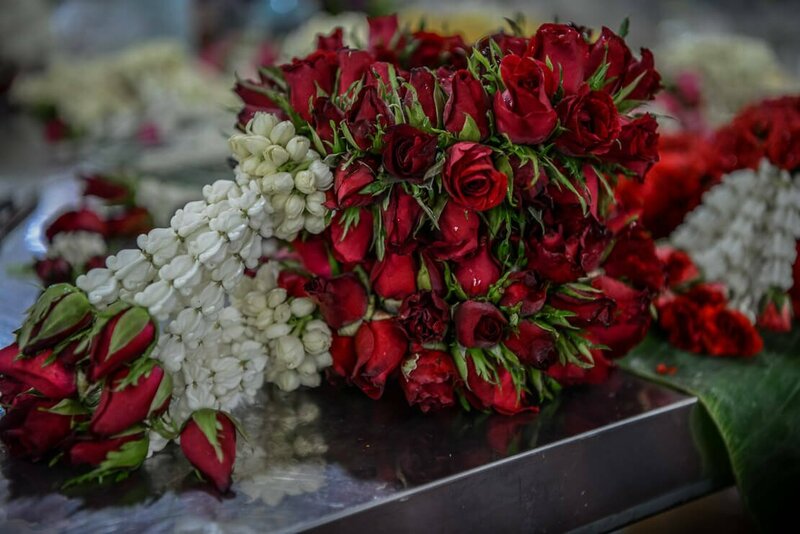 Pak Khlong Talat (Flower Market) is the biggest wholesale and retail fresh flower market in Bangkok. 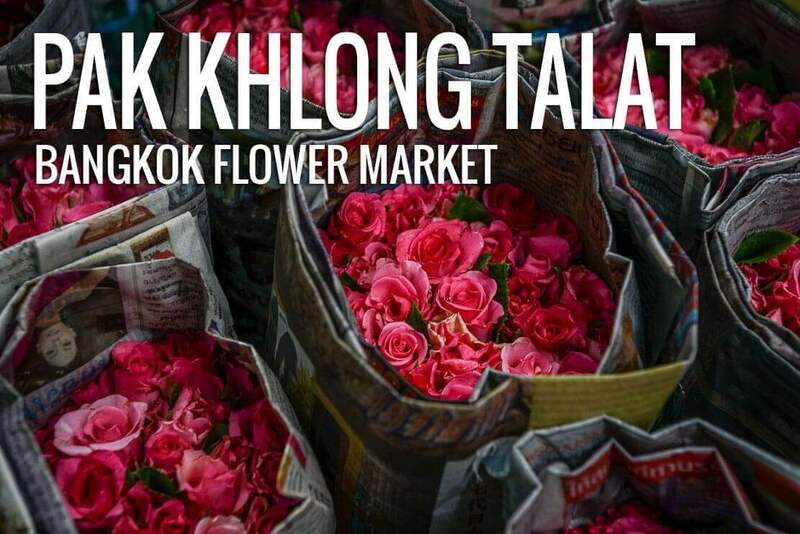 Some even claim that Pak Khlong Talat is one of the world’s largest flower markets. Pak Khlong Talat is located in the area, where small canals met the Chao Phraya river. This is how it got its name. 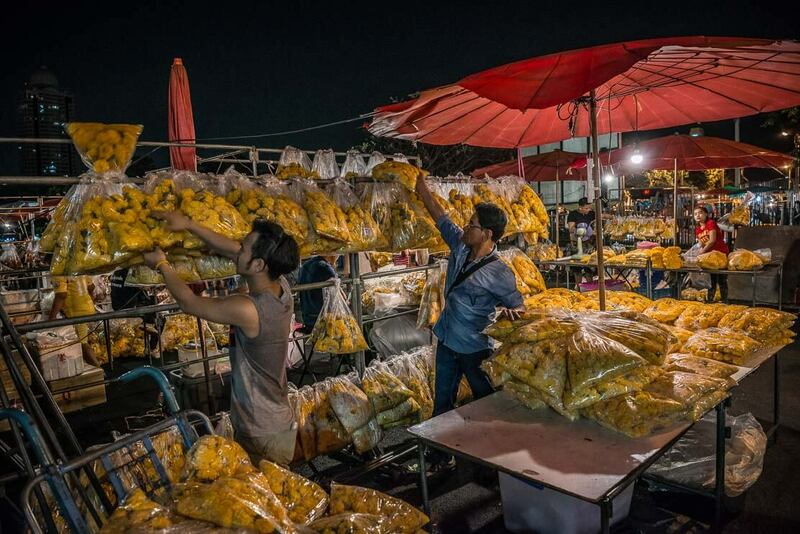 Pak Khlong Talat translates as the “market at the mouth of the canal”. In Thai, “pak” is mouth, “khlong” is canal and “talat” is market. 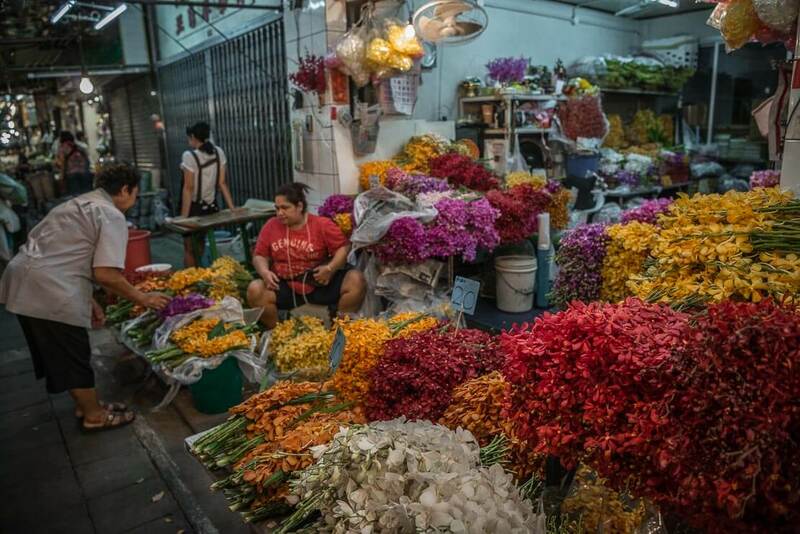 This iconic flower market in Thailand has a long history. 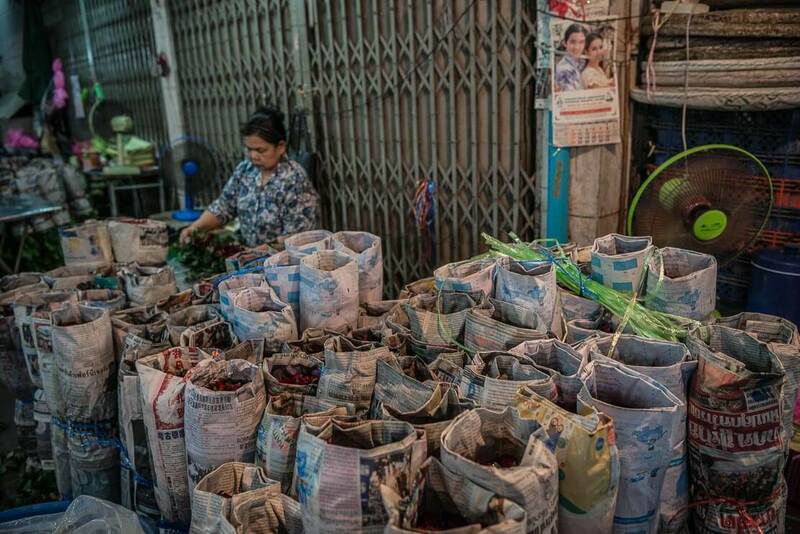 Pak Khlong Talat wasn’t always a flower market. 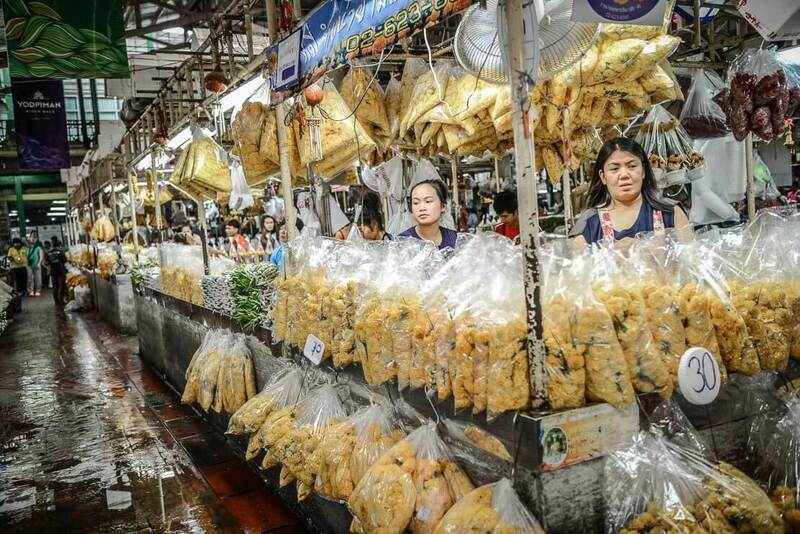 Back to the 18th century, it was a floating market, which was later converted into a fish market. 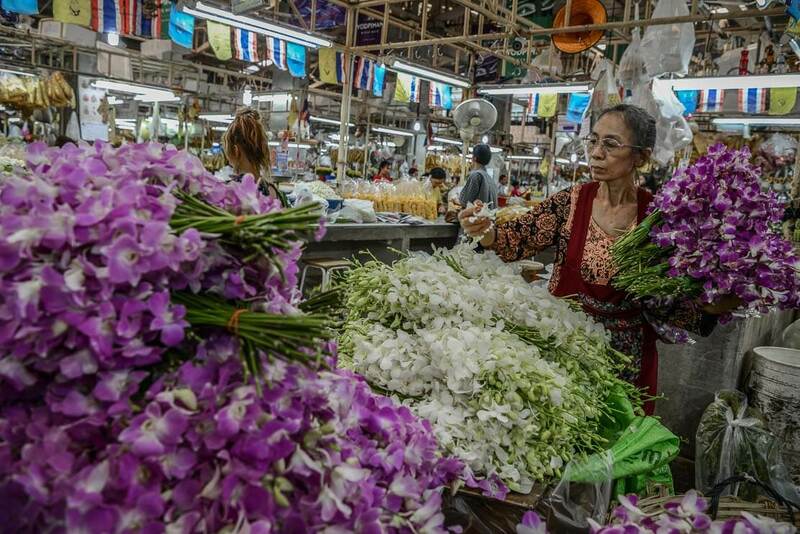 When the Bangkok authorities decided to get rid of the smell of fish in the middle of the city, the fish market was transformed into a flower market. 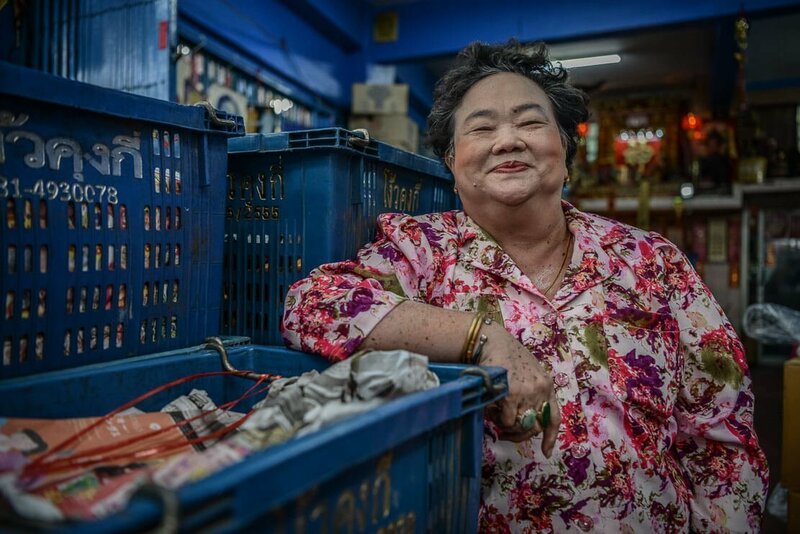 Pak Khlong Talat isn’t just one market building. 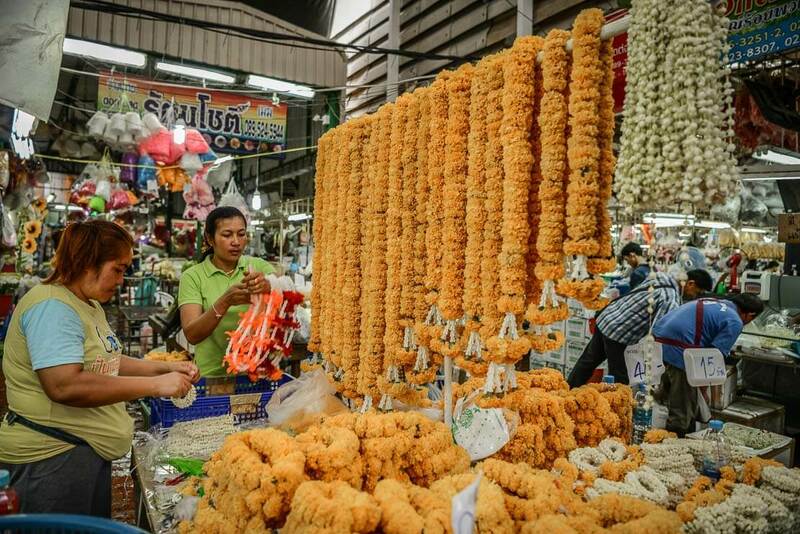 The name “Pak Khlong Talat” is used for the whole area with countless flower stalls, shops and markets along both sides of Chak Phet Road, which all form one giant flower market. 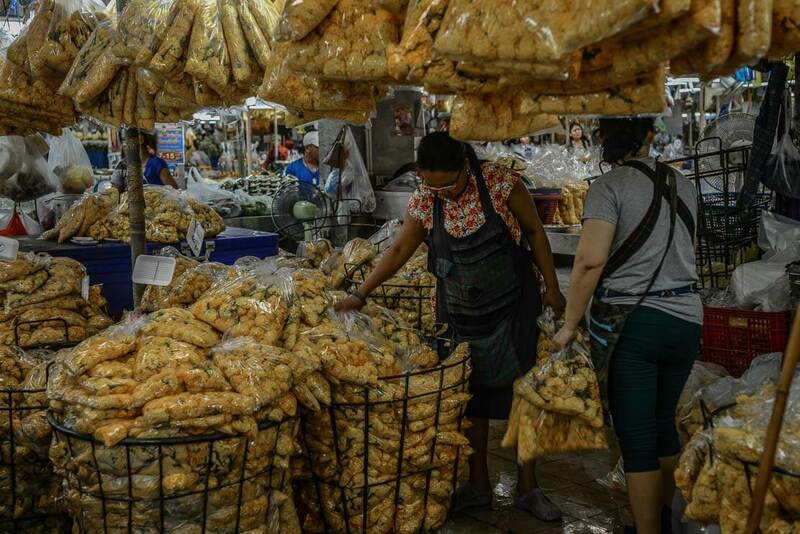 I visited the market three times, and only my third visit was successful. Why? 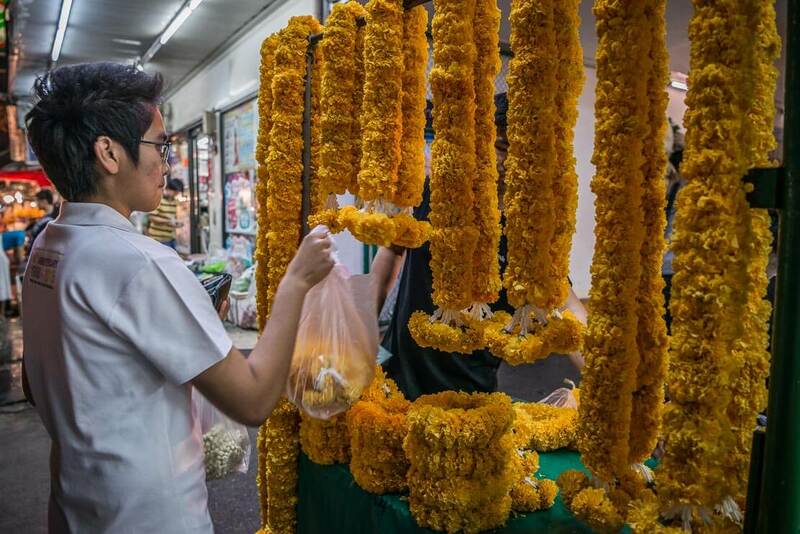 Bangkok’s insatiable appetite for everything fresh, including fresh flowers, ensures that Pak Khlong Talat is open 24 hours a day. 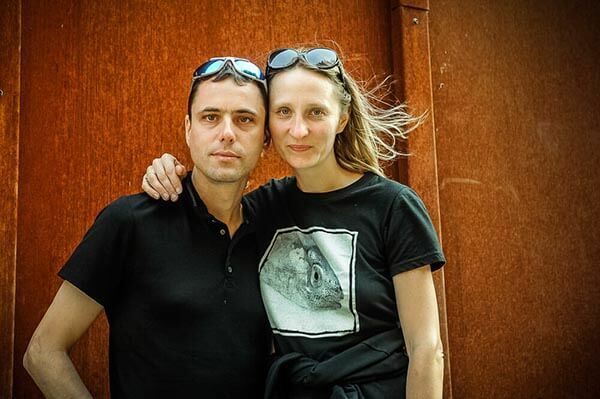 I read about its opening hours, and one afternoon when I found myself in the market’s neighbourhood, I decided to have a look. But the market was very quite and sleepy. 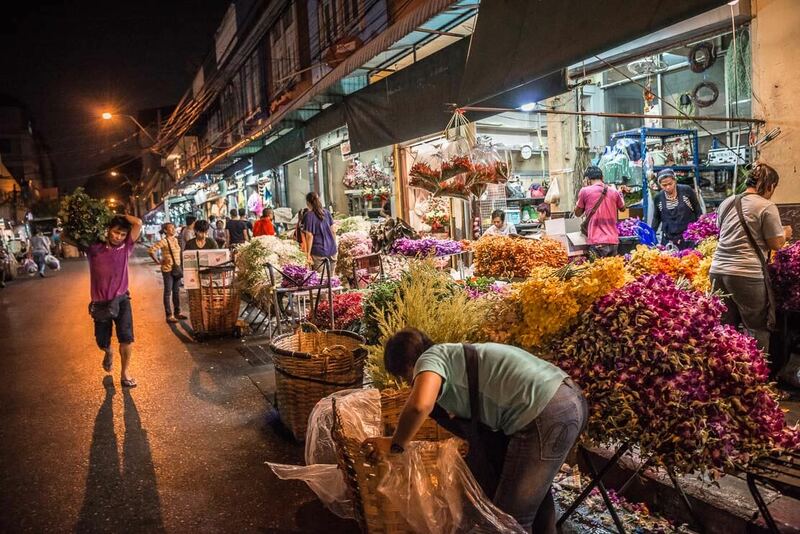 After having done some research on Internet, it turned out that the famous Bangkok Flower Market gets the busiest in the pre-dawn hours. Not discouraged by such an early start of the day, I rushed by taxi to the market. 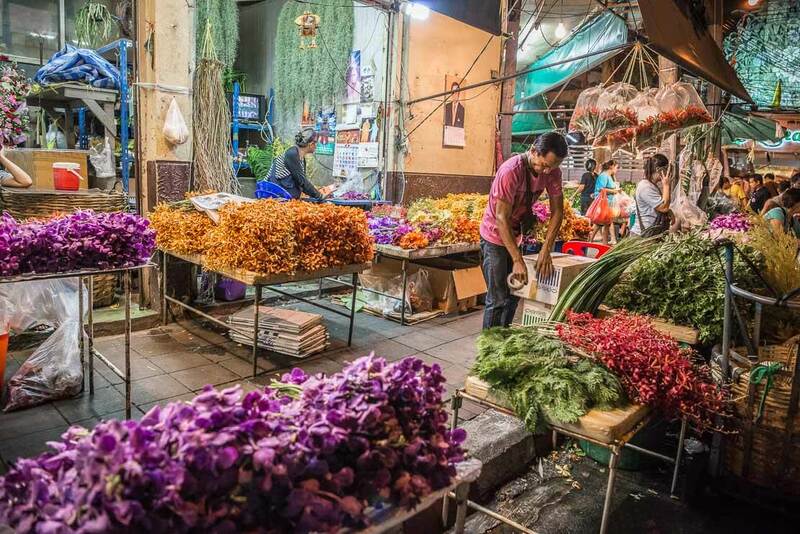 This time the market was active but where is the famous bustle and hustle, thousands of buckets with fresh flowers, and hundreds of traders and retailers? I decided not to give up. 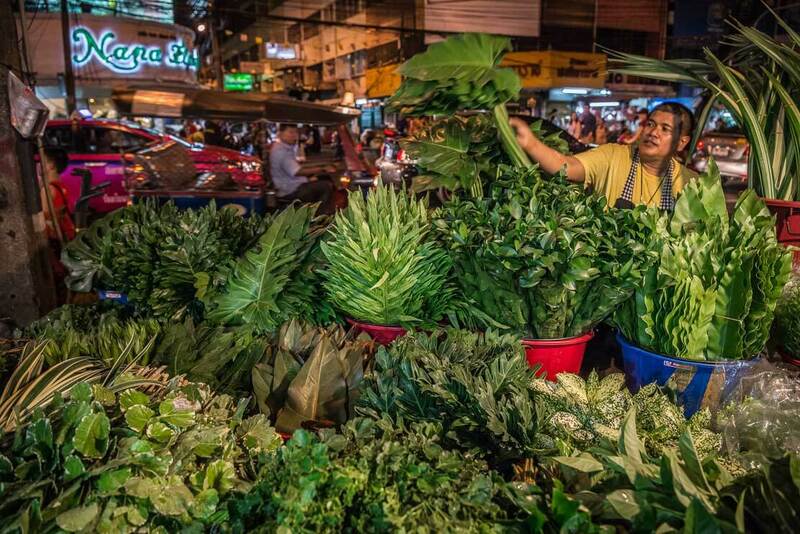 After several conversations with the locals, I discovered that the market’s busiest time is around midnight or at 3-4am. It’s a real night market. 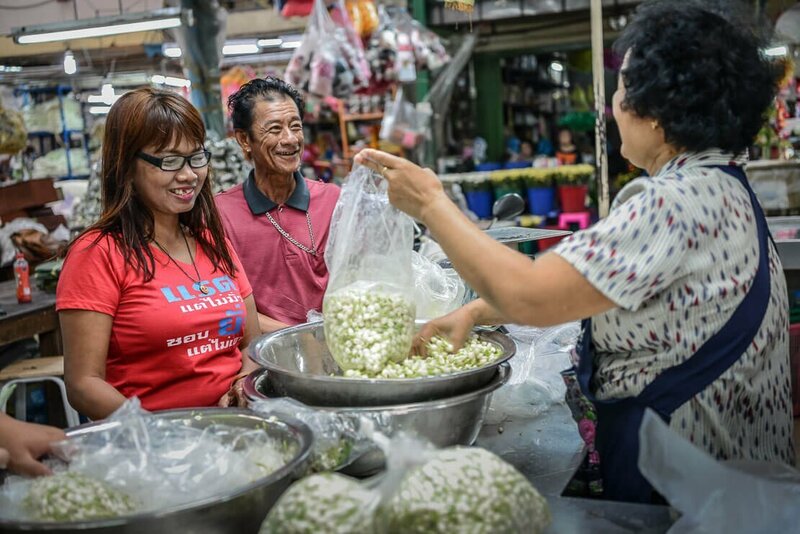 My third visit to Pak Khlong Talat was successful – this time the market was in full action. I arrived to the market before midnight. 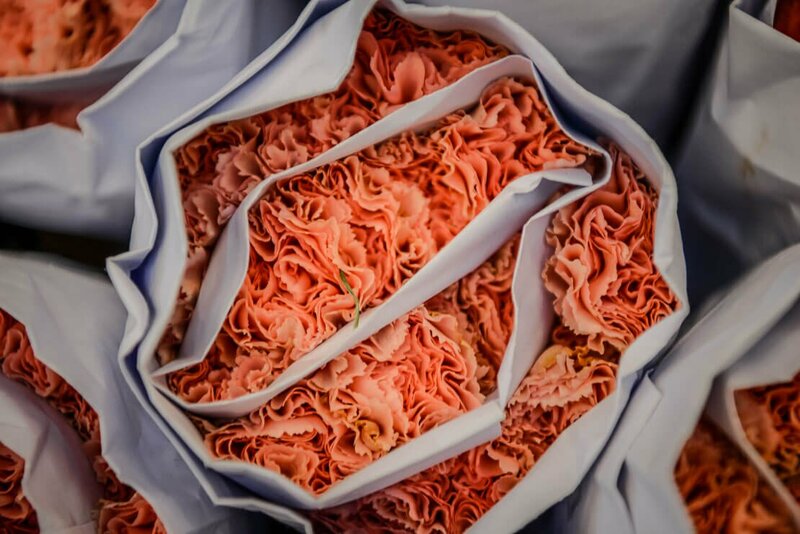 Not long after freshly cut flowers started to arrive in trucks and the roadsides began to transform into a bright and blooming floral carpet. 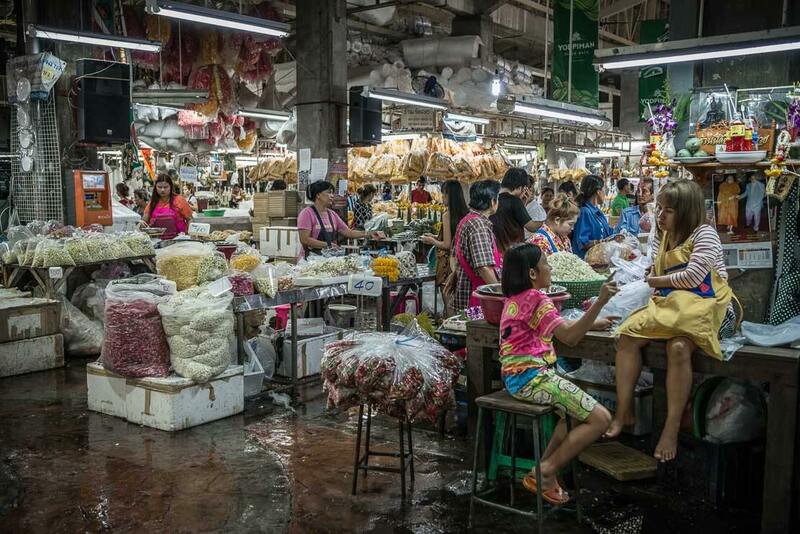 Soon, the market became chaotic and cramped. 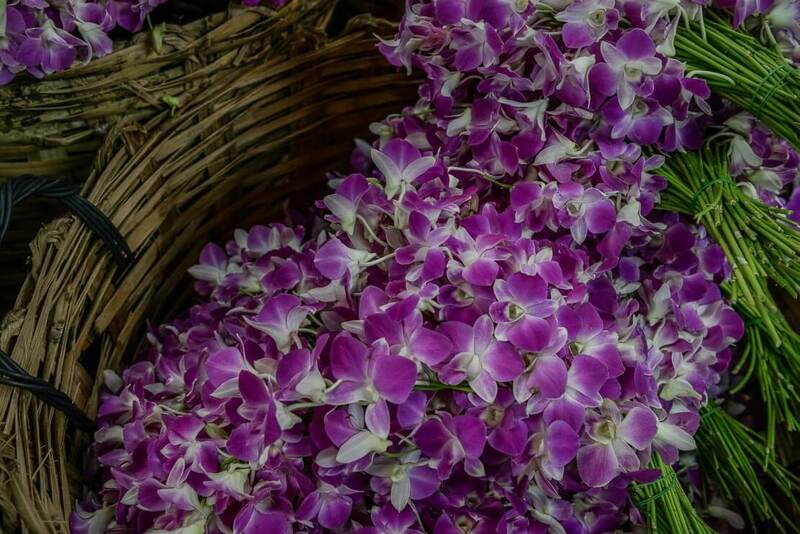 The flowers arrive to Pak Khlong Talat from the flower farms located in the nearby provinces but also as far as from Chiang Mai, Chiang Rai and Loei. 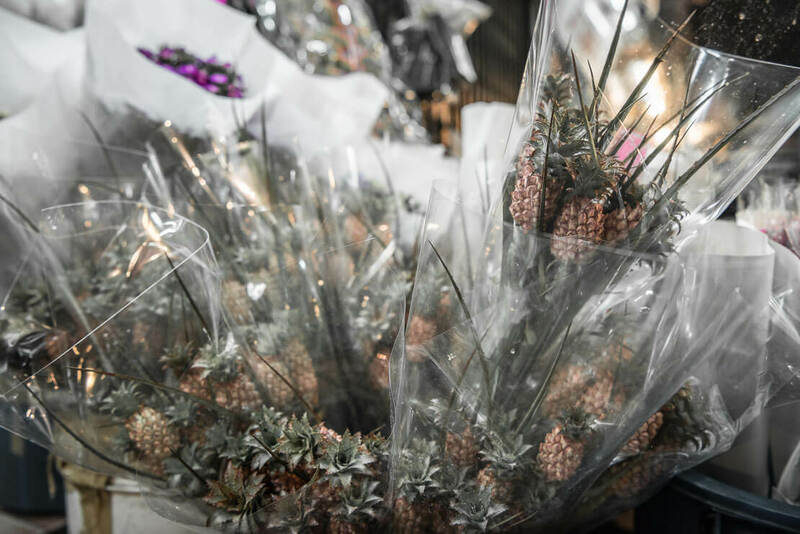 It was captivating to watch the pick-up trucks arriving and offloading large plastic bags and bamboo baskets full of freshly cut flowers. 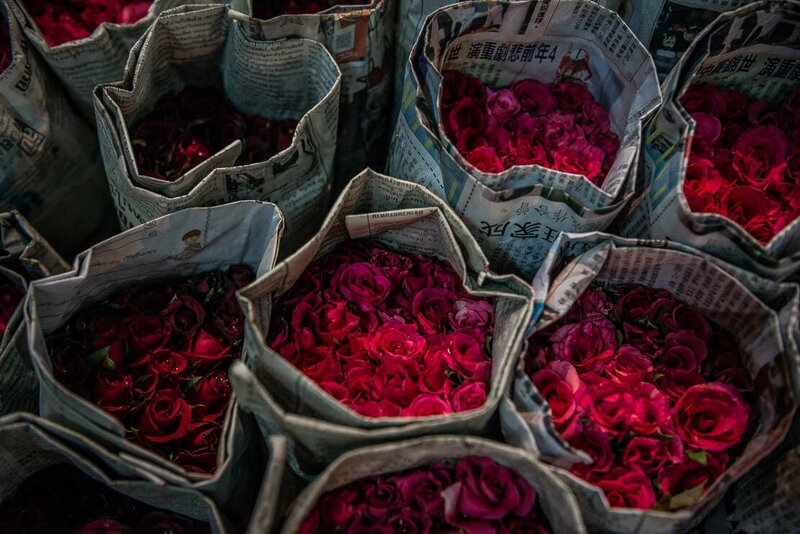 Among these delivery trucks, tuk-tuks and motorbikes with overloaded with flowers were coming from all directions. 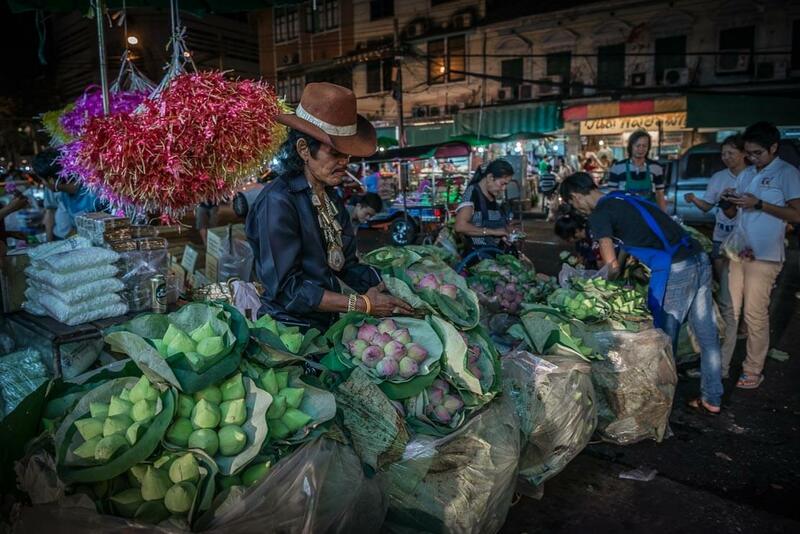 Oblivious to all this chaos, the locals were making their way through busy and crowded flower stalls and food street vendors were rolling their pushcarts with ubiquitous muu ping (pork skewers) and som tam (papaya salad). I went into the main Pak Khlong Talat building. Inside this warehouse-like structure, agile trolley men in rubber boots were rushing their carts with piles of flowers through the narrow alleys. With all this frenetic activity around, this is definitely not a place to gawk. While it’s the busiest time for the trolley men, it’s a rather quiet time for the vendors. 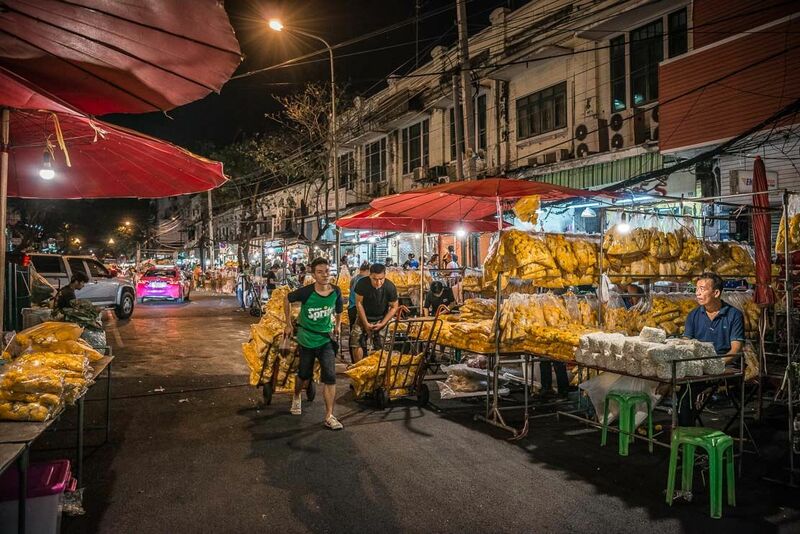 Traders and retailers start to flock to Pak Khlong Talat around 3am, and the vendors are getting ready for their arrival. 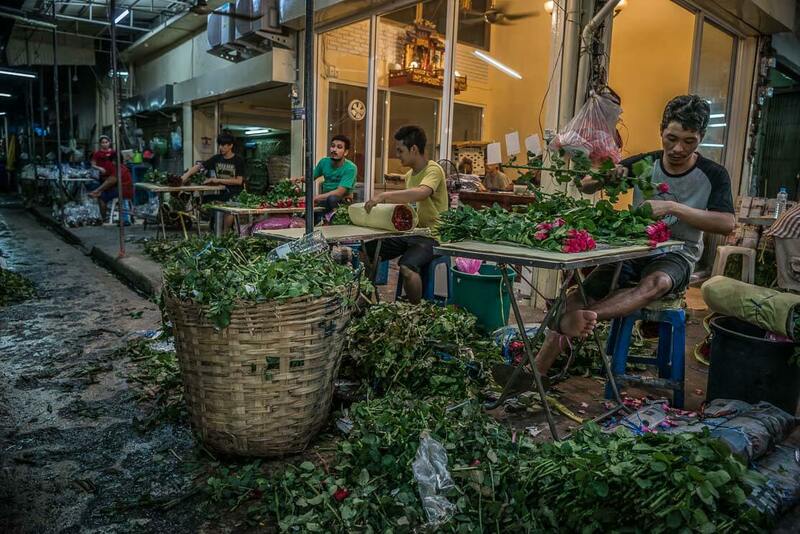 They are cutting out old leaves, trimming the flowers, rearranging them in the bamboo baskets and adding more ice to keep the flower buds closed. 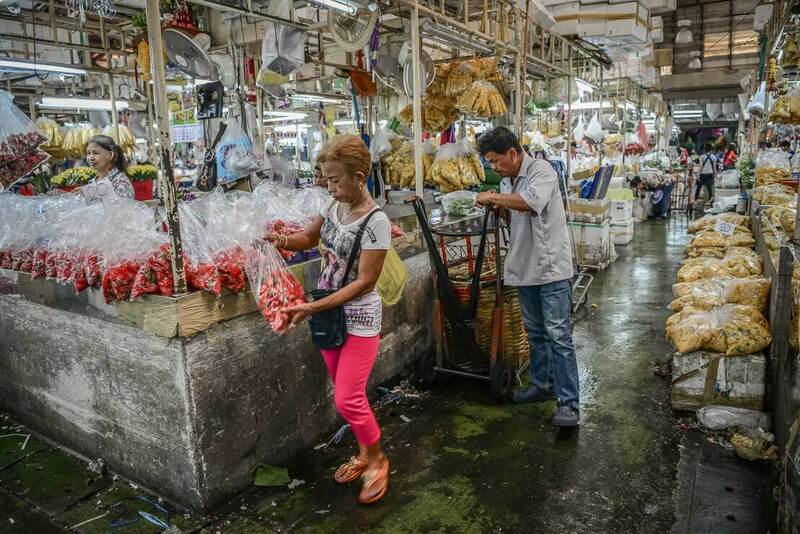 Some vendors are simply sleeping oblivious to the bustle around them. Some are playing cards. Some are smoking. Some are chatting and laughing with each other. 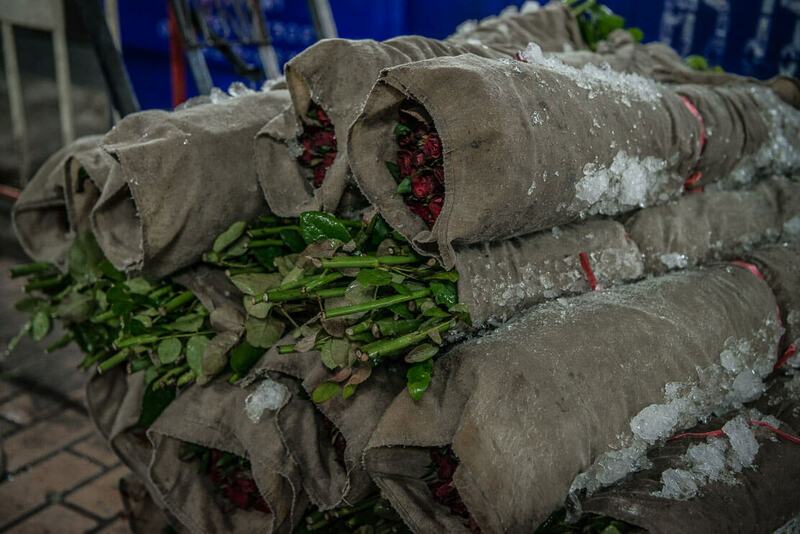 Soon the entire floor was covered with flower petals and crushed ice. I was slowly wandering around admiring the endless sight of flowers. The market is huge. Every square meter was covered with orchids of various colours and varieties, beautiful roses, lotus buds, marigolds, lilies, jasmine, Aster Peacock, chrysanthemum, gerbera etc. 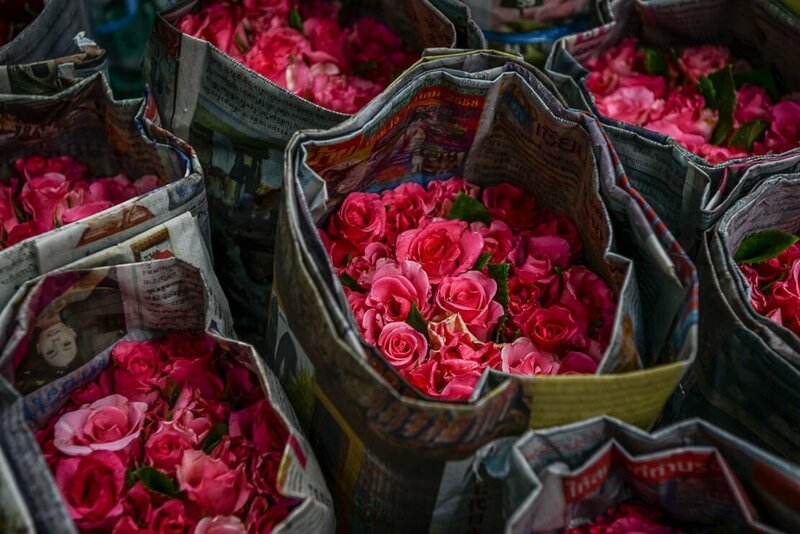 The flowers stalls occupy a few adjacent streets, and street vendors with their piles of colourful flowers are fighting for the attention of potential buyers. 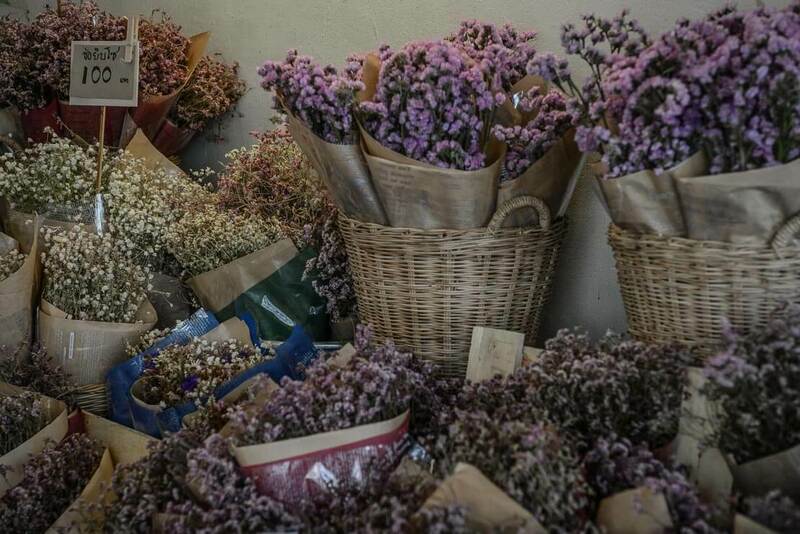 I was wandering around and getting lost amid the endless array of flowers. 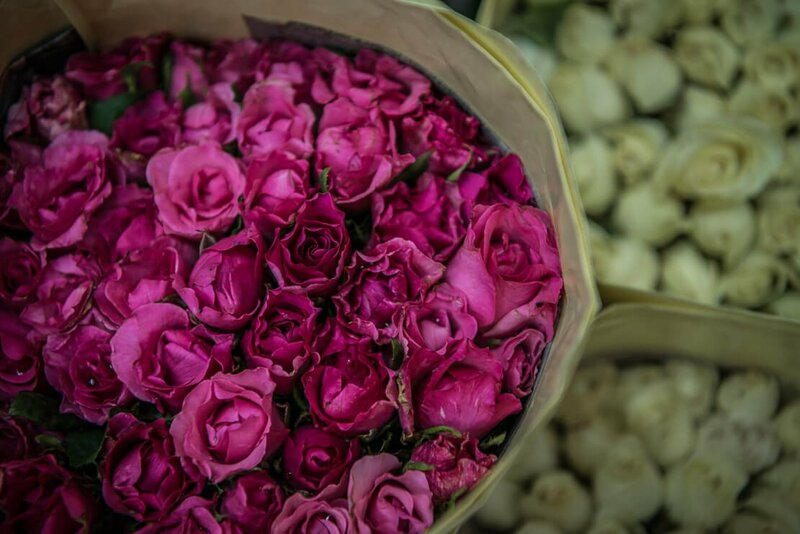 With all this sight of millions of fresh and colourful flowers, I was barely resisting the temptation to buy – if only I’ve lived in Bangkok. 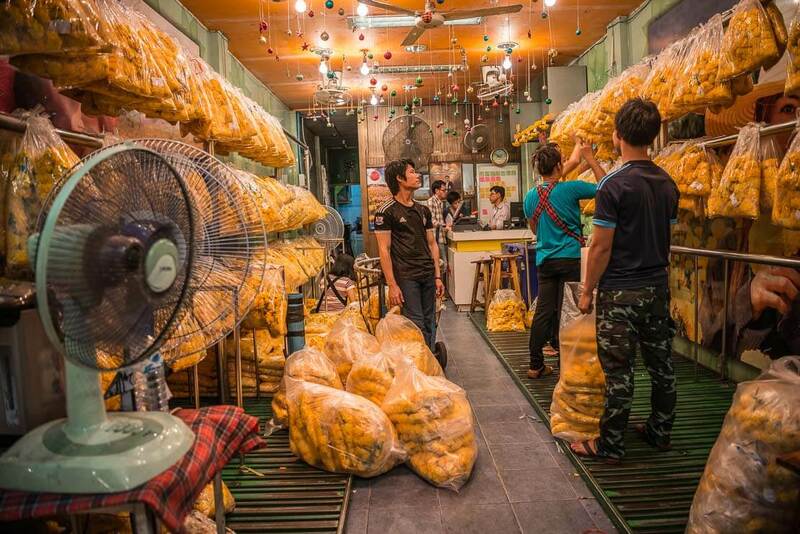 Phuang Malai is sold everywhere. 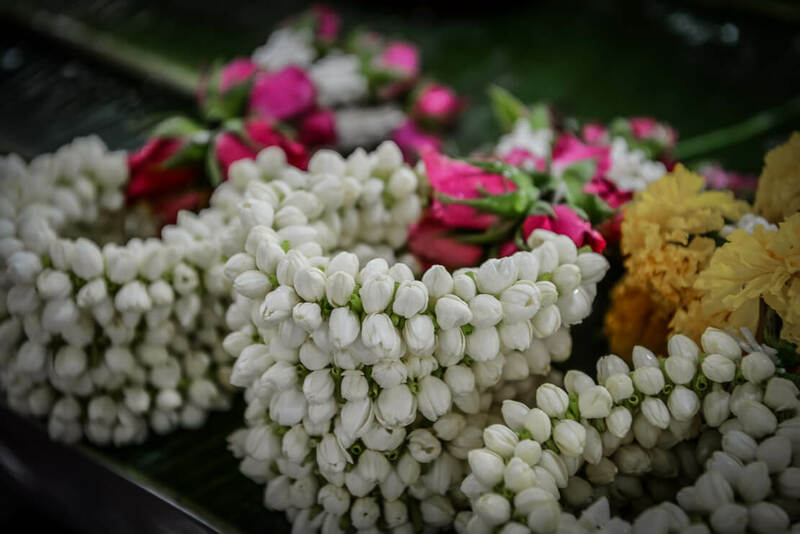 These Thai traditional flower garlands symbolise good luck. They are offered to temples and special guests as a sign of respect. 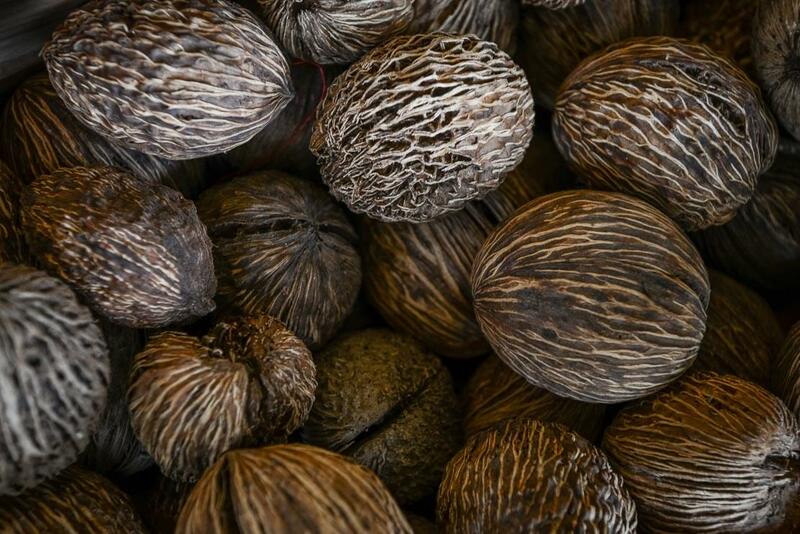 They often dangle alongside protective amulets in Thai taxis. 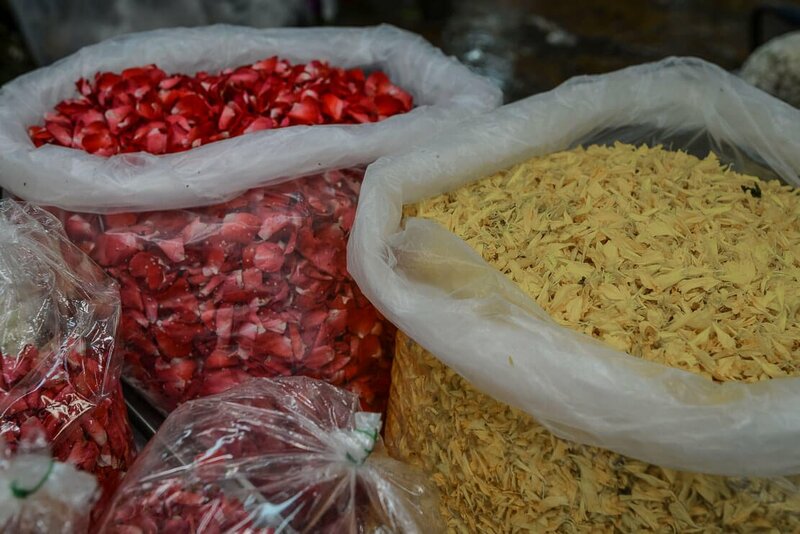 Phuang Malai is created by stringing together the colourful flowers, usually orange marigold, rose buds and jasmine. 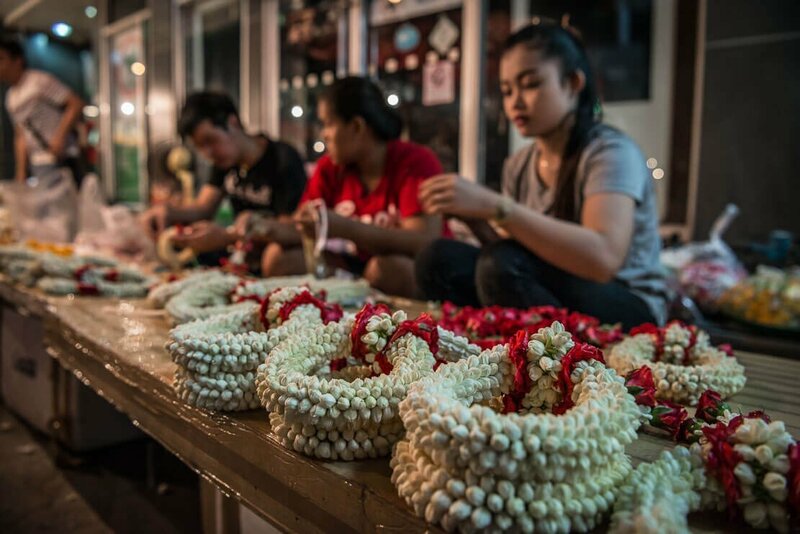 It’s fascinating to observe the women’ fingers threading the flowers into garlands with mechanical precision. 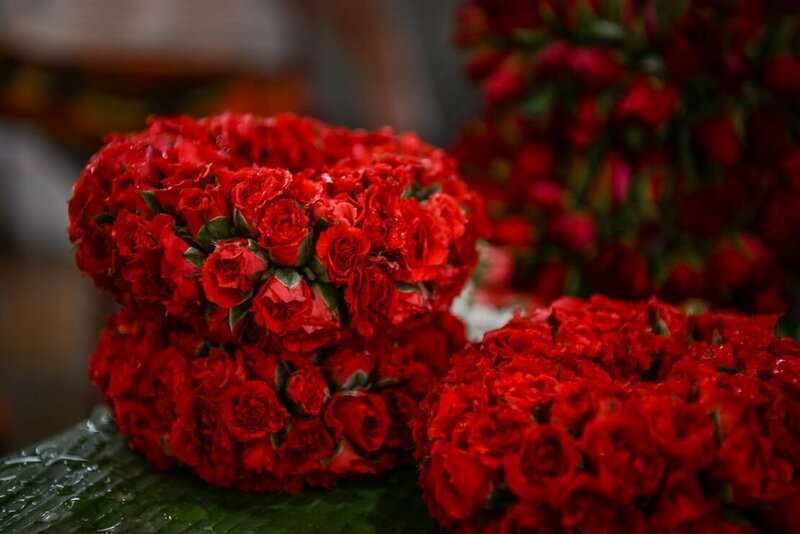 There are also Bai Sri, cone-shaped floral arrangements made from rolled-up banana leaves folded into various shapes and adorned with flowers, often chrysanthemum. 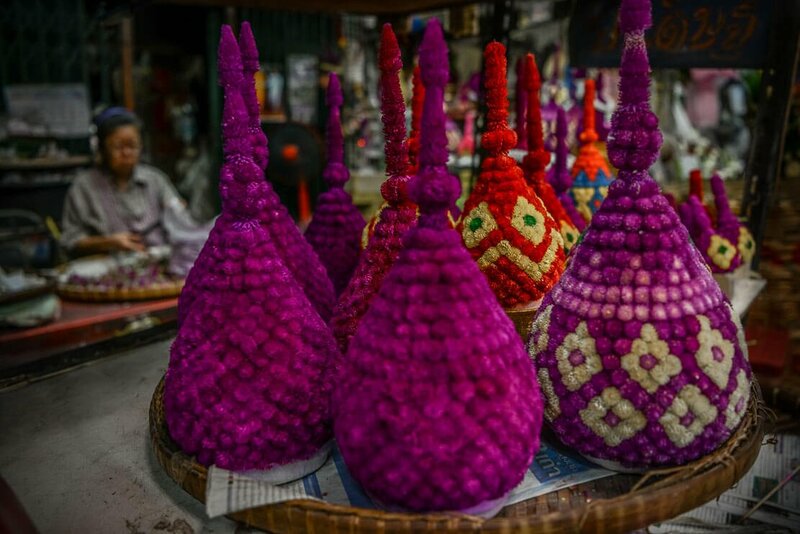 It’s used in the Isan region of Thailand for a welcoming ceremony as well as for weddings and other important ceremonies. 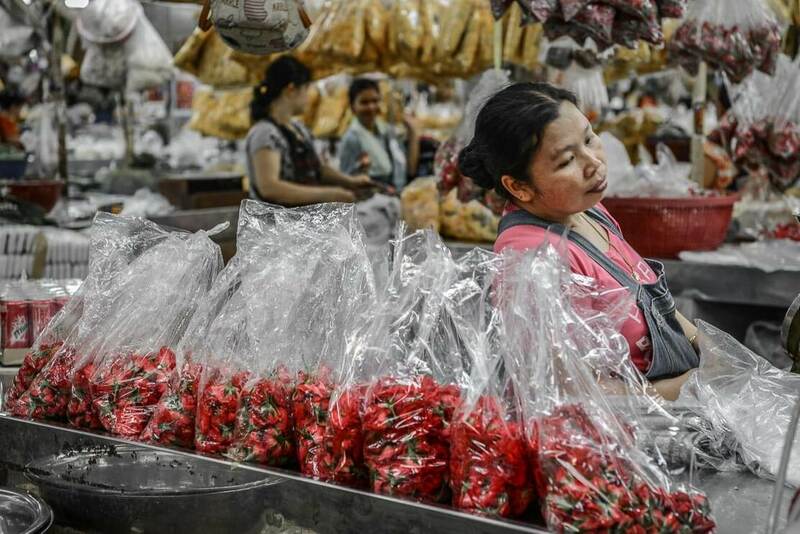 Soon the market became even busier and more chaotic. When I was about to leave, a smiling old lady gave me a fragrant rose and jasmine Phuang Malai for good luck. 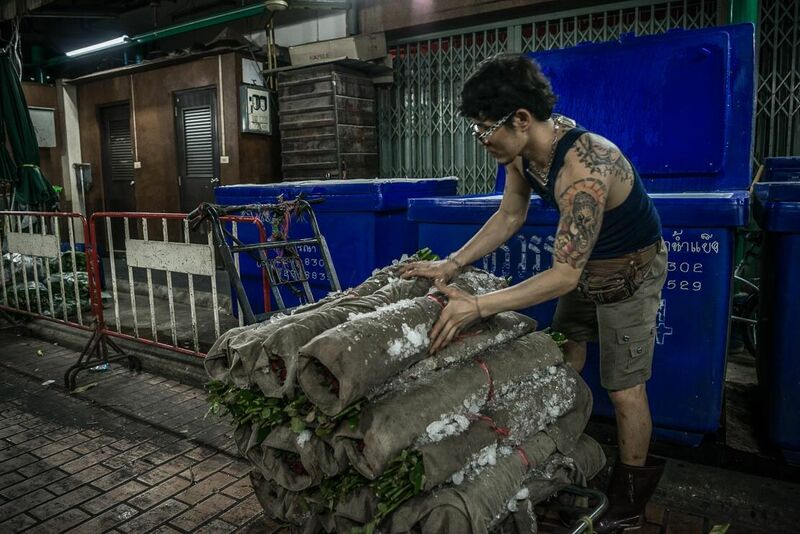 But I was already feeling lucky to be able to visit the iconic Pak Khlong Talat. 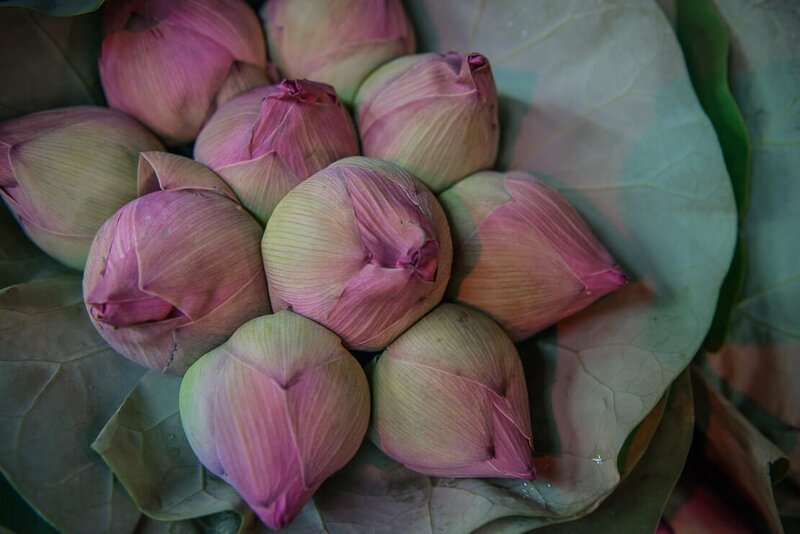 Location: Pak Khlong Talat (Flower market) is located at Chak Phet Road, a few blocks away from the Memorial Bridge, Wat Pho (Temple of the Reclining Buddha) and Chinatown (Yaowarat). 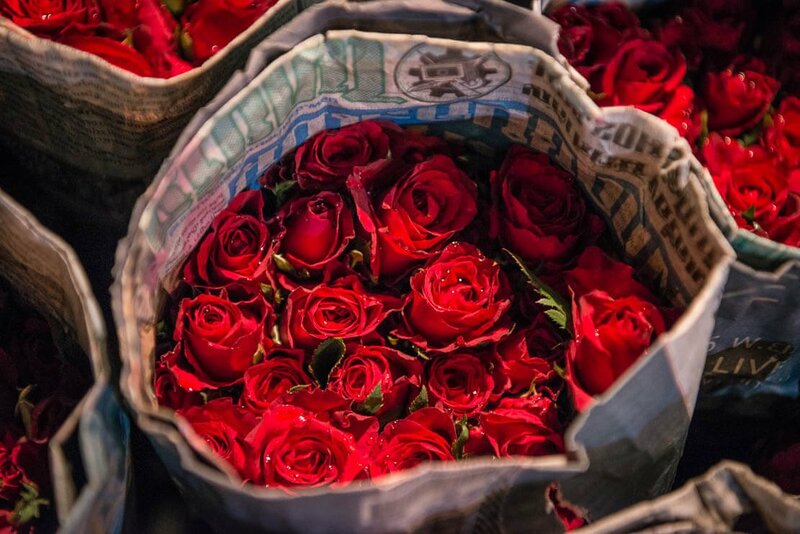 Transportation: The best way to get to the Flower Market is by river boat. Take the Skytrain to Saphan Taskin station (Silom Line), then take the Chao Phraya Express boat, and get off at Yodpiman Pier. 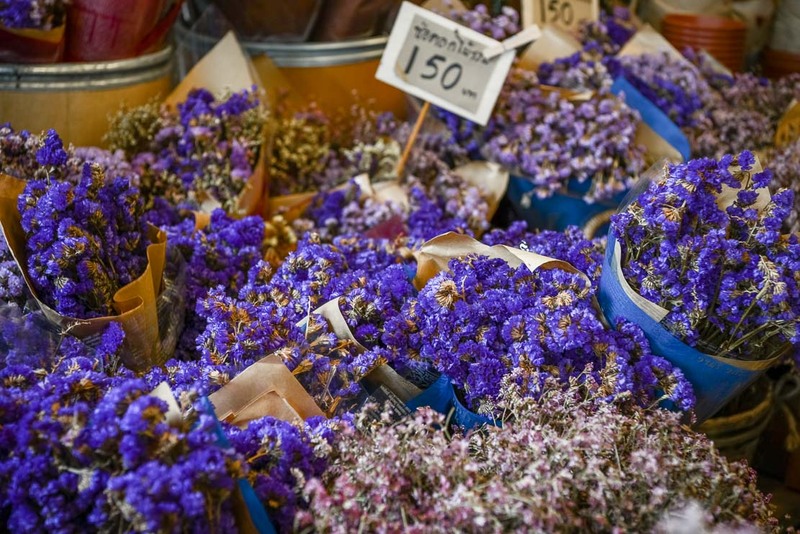 The Flower market is within a short walking distance from the pier. Opening hours: 24 hours per day, 7 days per week, 365 days a year. 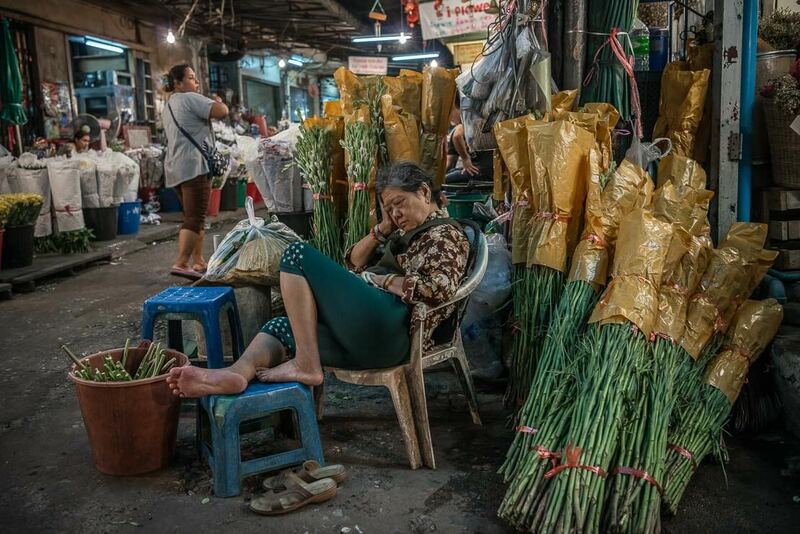 After dawn and during the day, the Flower Market is very quiet and sleepy but still a good place to visit. 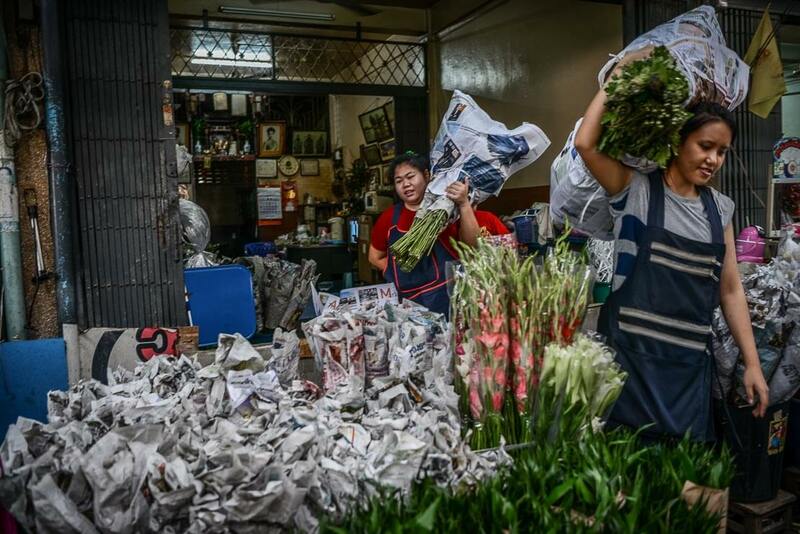 Pak Khlong Talat is the busiest around mid-night, when delivery trucks arrive with flowers or around 3-4am when traders and retailers flock to the market to buy their stock. Additional information: There are no Skytrain or metro stations nearby. 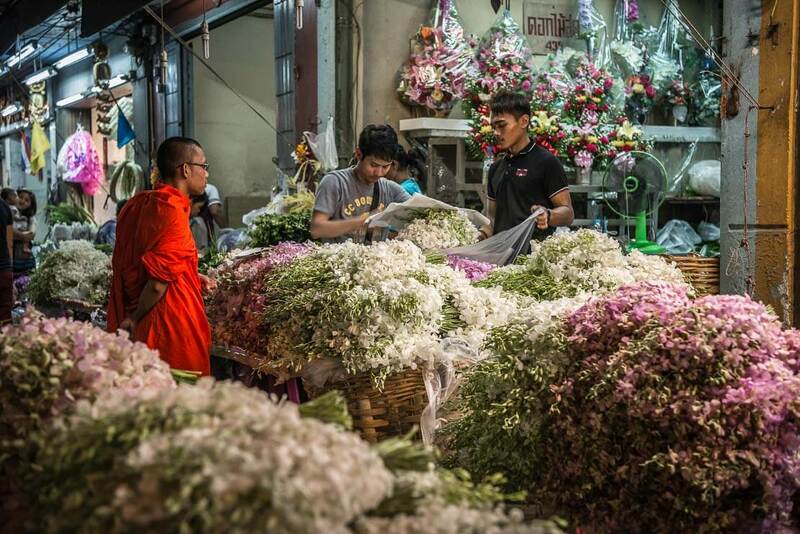 If you visit the Flower market late at night, the river boat service is no longer available, and the best way to get home is by Uber, taxi or tuk-tuk.